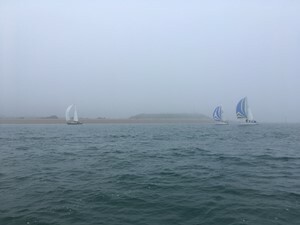 The yachts competing in the RNSA(P) Wednesday series could be forgiven for thinking it was the start of the Autumn not the Summer Series as they made their way out of foggy Portsmouth harbour to an equally foggy Gilkicker. The visibility at Gilkicker was sufficient to identify the transits of the start line and the SOOD Jolly Jack Tar decided prudently to set a basic leeward / windward course in Stokes Bay to keep the small fleet out of the shipping channels. With only 6 boats, one start only was called. At the start the fleet spread across the line with Danegeld the furthest inshore in slackest tide whilst the J109's and Tinker T opted for slightly better angles and more speed. The newly joined J109 of the Royal Engineers sailed the best downwind leg and rounded Browndown just ahead of Jolly Jack Tar. By this time the fog had intensified and all boats disappeared in the gloom at the start of the beat home. At the finish line JJT had managed to pass Trojan on the windward leg, the only difficulty being working out exactly where the line was. GPS lines and hand bearing compasses came into their own and after the number crunching JJT took the win in IRC from a hotly pursuing Danegeld with Trojan on her RYA base number taking NHC.